The Emory Urban Health Initiative has been awarded a $10,000 grant from the Woodard & Curran Foundation to expand the education outreach program at its unique urban community garden located in a vacant parking lot behind a grocery store in northwest Atlanta. The Emory Urban Health Initiative received initial support to start the urban garden as part of the Sustainable Partnerships for Atlanta Neighborhoods (SPAN) project funded by The Coca-Cola Foundation. SPAN is an initiative of Emory’s Office of University-Community Partnerships which was created in 2000 to integrate the university’s teaching, research, and service missions to strengthen Atlanta-area communities. Students and volunteers from the community began planting seeds in raised flowerbeds this past winter creating the Super Giant Foods Community Garden to help increase health food access for local residents in northwest Atlanta. The first harvest was celebrated in early May with an abundant assortment of healthy and free organic vegetables to share for local residents. "We are excited to receive this grant to further the important work of our program. Being able provide access to a sustainable healthy and organic food source for local residents is critical to narrowing the health disparities gap," says Charles E. Moore, MD., associate professor in the department of Otolaryngology at Emory University School of Medicine, chief of otolaryngology at Grady Memorial Hospital and co-director of the Emory Urban Health Initiative. With the help of community partners and volunteers, the Emory Urban Health Initiative Super Giant Community Garden project promotes sustainable green practices teaching lessons on rainwater capture, composting, litter clean-up, proper disposal of water, material recycling, organic and natural gardening techniques. 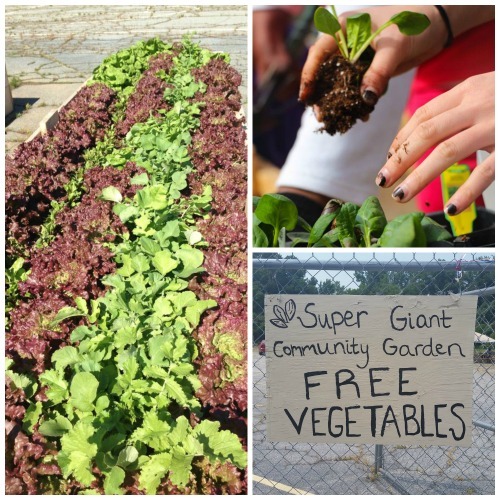 The community garden is an integral part of the Healthy Hub plan which includes the Super Giant Foods grocery store, a community kitchen, HEALing Community Center Urgent Care Clinic, childcare facilities and a laundromat. Using a multi-partner, inter-agency and community-driven approach the planned Northwest Atlanta Healthy Hub will to address issues related to food security, food access, obesity, and other social determinants of health. Woodard & Curran Foundation is a public nonprofit organization dedicated to directing endowment resources to nonprofits with environmental missions focused on creating a healthier world. This year the Foundation received more than 60 eligible grant applications from non-profit organizations striving to promote a clean and sustainable environment.